Thai food – the hot, exotic cuisine of South East Asia. Thai food are oftens prepared with very strong, wakes-your-palate ingredients. While most Thai recipes tend to sway on the simplicity side, there is a complex harmonization and layers of flavors, a real treat for the taste senses. For this recipe, I seared chicken wings, then baked it in the oven at 400 degrees for a healthier alternative to the popular fried wings. 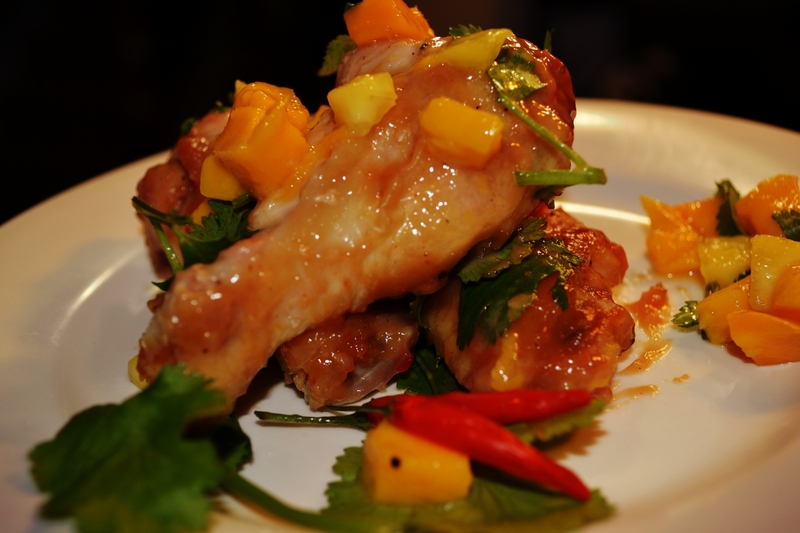 Then, I dressed the wings in a creamy peanut butter, coconut milk and Thai hot chili sauce. The result was amazing. 1. Season your chicken with salt and pepper, 1 tbs of coconut oil, 1 tbs of ginger and shallots. Let marinate for at least 30 minutes. 3. Heat the remaining oil on high heat in a frying pan, sear your chicken until golden brown on both sides. No need to cook through as you will bake your chicken soon. Add more oil if needed. 4. Line your baking sheet with aluminum foil. Arrange your chicken to prepare the baking process. Careful not to overlay the chicken. 5. Bake your wings until it reaches 165 degrees, approximately 45 minutes. 6. 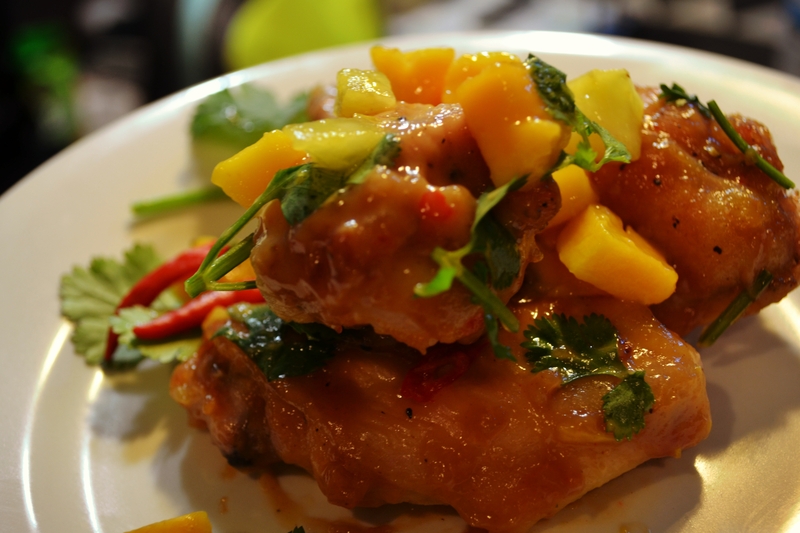 While your wings bake, using a sauce pan over low heat, whisk together the coconut milk, peanut butter, thai chili sauce, fish sauce, lime juice, the rest of your ginger, sugar, sriracha and lemon grass. This will be your sauce. For this step, you can certainly use fresh lemongrass. Personally, I prefer frozen pre-chopped lemongrass. It’s a lot easier as I hate prepping, and I’m really bad at chopping. Add more sriracha to increase the spicy level. 7. 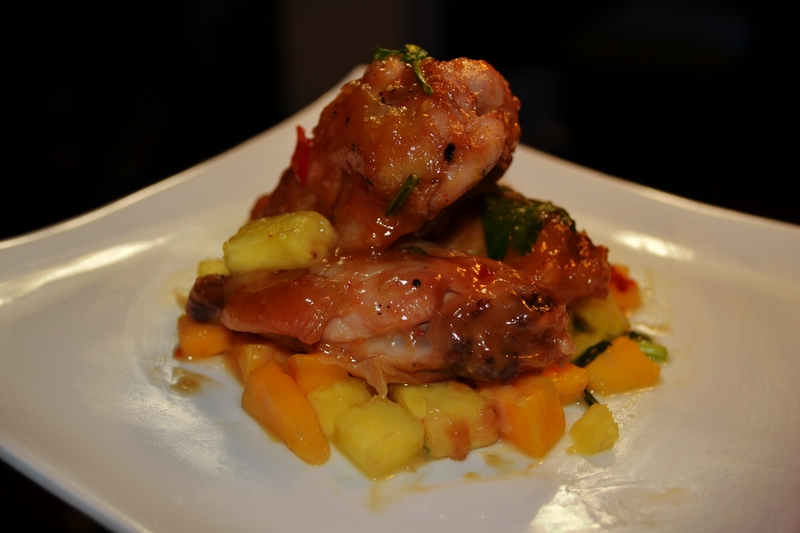 One your wings are cooked, remove from oven and combine with sauce in a mixing bowl. I garnished mine with diced mango tossed in salt and lime juice. Serve and enjoy!